I can't quite believe it, but we've been living in our new home for five weeks! After three months of sanding, painting and knocking down walls, we finally moved into our little house on the hill just over a month ago. The past few weeks have all been about settling in, moving things around and trips to the garden centre to fill our home with plants. I already have my favourite places to sit and relax, and feel like I could walk around the house in the dark and know where everything is. It's crazy how quickly a place becomes home. We still have a lot of work to do to complete the renovations, but I've already waited too long to share the rooms that are almost complete. I'm going to start with the biggest transformation: the bathroom. There are still a few finishing touches that we need to purchase (a mirror, a bin, the bath caddy I've always wanted) but it's 99% there. When we bought the house, the bathroom was a dark, dingy hovel that terrified me. 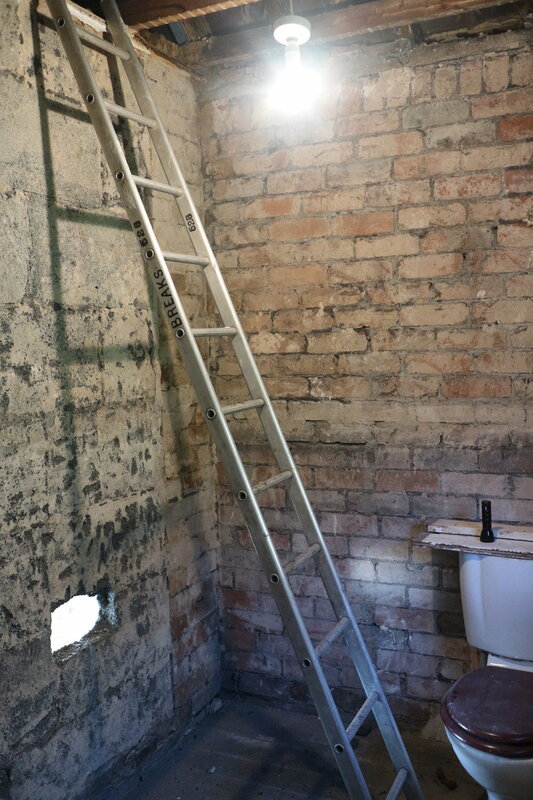 Bare brick walls (complete with gaping holes), no ceiling and a disgusting old toilet. No bath, no sink. I couldn't imagine that it would ever be a room that I would want to spend time in, let alone feel comfortable showering in. I had ideas of how I wanted it to look, but until our bathroom fitter got stuck in, I was dubious that my plans would pay off. My vision was pretty simple. The bathroom was small and dark, and I wanted it to look larger and brighter. The layout was the first decision to tackle, as I initially wanted a wet room but was talked into getting a bath. I've now come around to the idea, and I'm determined to spend the winter months soaking in a hot bath with a good book (I've always been a shower person) but this meant that we had to get clever with the space that we have. In our old bathroom, the bath was down the length of the room with the sink and toilet cramped beside it. For the nine years we lived in that house, I hated that bathroom and was determined to try something different in our new home. So, our bath is positioned against the back wall of the room, the sink and toilet facing each other in front of it. The difference it makes is staggering; it feels like a much larger room. In terms of making the room brighter, there wasn't much I could do. Our bathroom is at the back of our south-east facing house, meaning that it is in darkness for most of the day (other than late afternoon, when the light shining through the window is perfect). 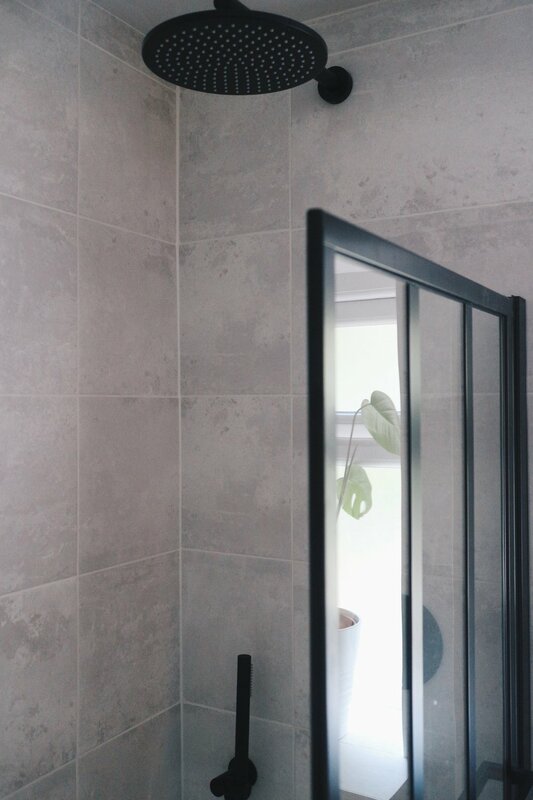 To brighten up the small space and make it seem larger, I opted to use the same large tiles on all of the walls, the floor and up the side of the bath. Using one material (pale grey concrete tiles) simultaneously made the room look larger and brighter. Another trick for creating both of these illusions would be to add a large mirror to the wall but we are still searching for the perfect mirror to place above our sink. It took ages to find the perfect unit for our sink to sit on. I'd already purchased a bowl sink that I knew I wanted to sit atop a vanity unit but I wanted something that floated to make it easier to clean the floor and again, to create the illusion of a larger room. The teak unit that we eventually settled on is perfect and I actually love that its small cupboard is the only place for storage in the room - it's helped me to be more minimal when purchasing products. For the fittings, I knew that I didn't want any stainless steel as I hate how it looks (it's also banished from our kitchen!). Instead, I found myself attracted to either brass or black fittings. As brass didn't fit with the look we were going for, I opted for black taps, wastes and shower heads and I'm completely delighted with how they look. Every time I walk into my bathroom, I feel like I'm in a luxury hotel, and it's those little touches that make all the difference. We even opted for a black framed shower screen and a black towel rail to complete the look. Throughout the rest of the house, I've added carefully positioned personal touches (vases, books, prints, etc.) but in the bathroom I've chosen to keep it simple. My favourite and most-used products are on display on the shelf above the sink for easy access and a touch of personality. One of our monstera plants sits in the window sill. A soft and fluffy pile of Soak & Sleep white Egyptian cotton towels are folded on the vanity unit. Other than that, we've kept the room pretty minimal. Once we eventually get our doors put on, my Soak & Sleep towelling dressing gown will hang on a wooden hook on the back of the bathroom door, ready to slip on when I climb out of the shower. One thing that I really wanted to achieve with this house was a sense of consistency when you walked through it. I wanted the rooms to all feel like they flowed and have elements that traveled throughout. I'm really into interior design and didn't want to get carried away with all the different styles that I like in pictures. And it was also important that both Dave and I were equally happy with each room. We both love Mid Century Modern design and Scandinavian elements which made it easy to plan how we wanted our home to look. The furniture that we brought with us from our old house is mainly teak, so the bathroom cabinet fits in perfectly. There are also touches of black throughout the house and plenty of greenery in every room. I'll be sharing the rest of our renovations soon, but for now I'll leave you with the photos of our bathroom, before & after. I'd love to hear your thoughts on the room! The set of six white Egyptian cotton towels pictured above were kindly gifted to me by Soak & Sleep. All words, images & opinions are my own.